Each individual Couchbase Server-node can be referenced by a hostname, as well as by an IP address. You can specify a node’s hostname by using either the Couchbase Web Console or the REST API, during the process of node-configuration and cluster-definition. Initial configuration of Couchbase Server allows the node to be referenced by means of a default IP address: 127.0.0.1. You may choose to specify a different IP address, or a hostname. The hostname must be valid, and must ultimately resolve to a valid IP Address. 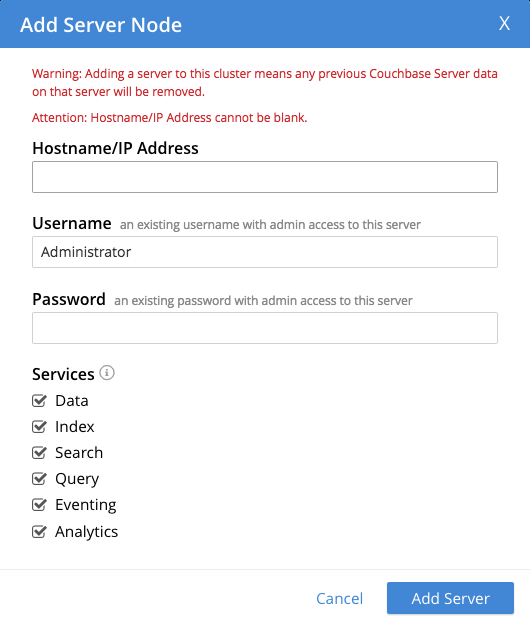 If you restart a node, Couchbase Server continues to use the specified hostname. Note, however, that if you fail over, or remove the node from a cluster, Couchbase Server will no longer use the specified hostname: therefore, in such circumstances, you must reconfigure the node, in order to re-specify the hostname. You can specify a hostname when performing initial configuration of Couchbase Server; when adding a node to an existing cluster; or before adding a node to a cluster, by means of a REST API call. Each of these options is described below. In the Cluster Name panel, on the Couchbase > New Cluster dialog, you can enter either a hostname or a specific IP address into the interactive text-field. Enter either a hostname or IP address into the interactive Server IP Address text-field. does not resolve to a IP address. connection exists for the address. Could not rename the node because name was fixed at server start-up. Could not save address after rename. Requested name host name is not allowed. Invalid host name provided. Renaming is disallowed for nodes that are already part of a cluster.